Needles are personal preference. I suggest you try a few and see which ones you like. They are to be considered a consumable item as even the best needles do not last forever. Needles are sized like beads, the bigger the number the smaller the size. 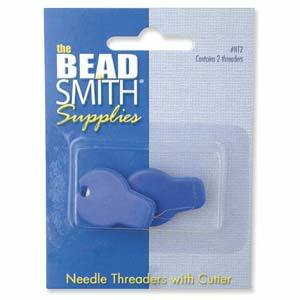 Beading needles typically start at size 10, the biggest, down to size 15 the smallest. The in between sizes are , 11, 12, 13, not sure why there is no 14 ! 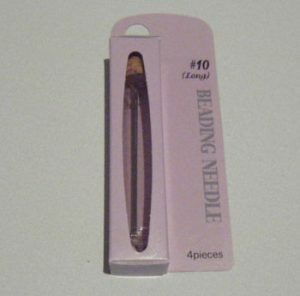 I use a size 10 most of the time, and switch to a smaller needles when needed. I do this as a size 10 is quite sturdy and has a marginally bigger eye, so easier to thread. 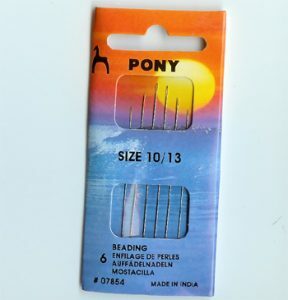 Many people prefer a size 12 as their regular needle. Size 13 and 15 are finer and most beaders only switch to these when needed. Most needles are long, but the John James bulk packs are available short in size 10, as are the Tulip needles, short available in size 10. Straw needles, also known as milliners needles have more of a round eye, so great for threading fireline, they are short needles though, not long. 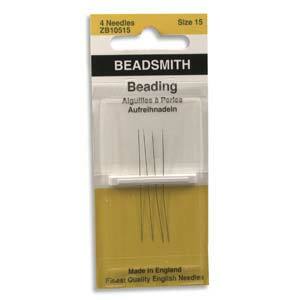 John James is a long established needle maker in the UK, the muti packs are branded John James, but the Beadsmith needles are made in the same factory. For a while John James moved their manufacturing to China, but I believed they moved it back to the UK after adherence to strict manufacturing standards dropped. These are available in sizes, 10, 10 short, 12, 13 and 15, plus mixed packs and bead embroidery needles. 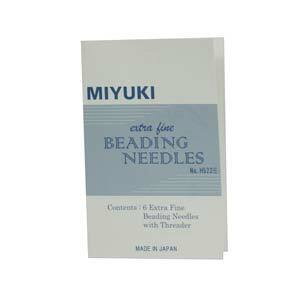 Miyuki do a mixed size pack of needles and it includes a needle threader. 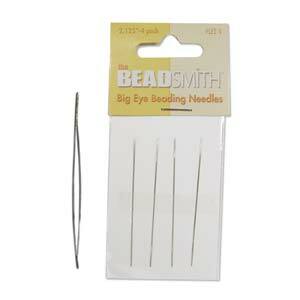 Quite new to the beading needles scene, these are considered top quality needles. They also come in a cute glass vial, with a cork top, because we all love great packaging don’t we 🙂 They are strong and resistant to bending, more so than other brands. 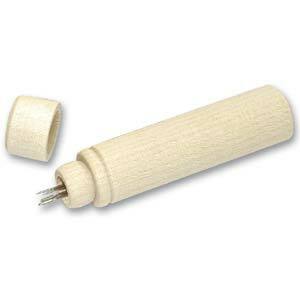 Tulip also make a great beading awl, but that is another topic to discuss another time. These are made in Asia, but still quite good quality, they come in mixed packs and certainly worth a try. Split or big eye needles. 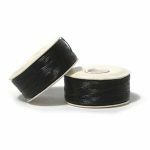 Those of you that struggle to thread a needle may love these. 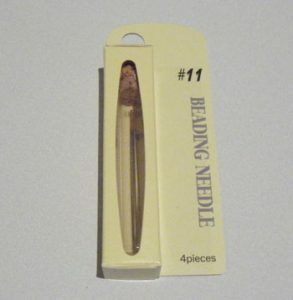 The whole length of the needle opens up for easy threading. Essentially they are two fine needles joined together at each end. 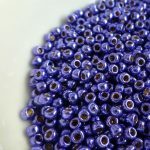 This obviously makes them a bit thicker than the other needles, but great if you don’t want to work with very small beads. Some people love them, some struggle with them. The secret is to be gentle with them, do not pull on them, but ease them through the eye of the needle, add the thread and coax it back again. A sudden yank on the threader is likely to break it. Also trying to use it with Fireline may cause problems as it won’t squash flat like a thread will. Where do you keep your needles? 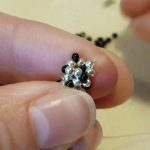 Mine tend to end up stuck in bead mats here and there, but why not use a needle case. 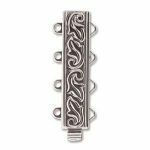 These wooden ones come in two lengths and are great for beading over too. Hope that helps you with needle choice. But once again, what is one persons favorite brand and size it not the same as someone else. 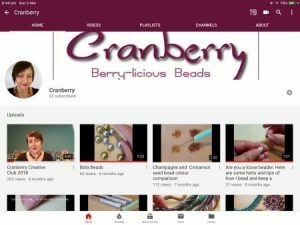 Give them all a try over time and find your favourite. Personally, I love the John James, size 12s I use them for pretty much everything.i love they way they bend to fit my beading grip! I just love the Miyuki by far my favorite needles. I like John James size 10 and 12. When it ends up looking like a winding road I get out my coated pliers and straighten them. 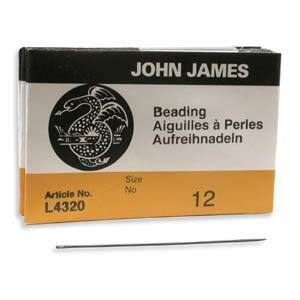 Until just recently I used the John James needles. I have now tried the Tulip needles and there is no going back to another brand now! I love the firmness of the needle. Yes they are more expensive but because the needle doesn’t bend or snap in half you it is worth the price. I knew it wouldn’t be long before the Tulip needles got a vote. I do love these needles too. I love the amethyst cab!!!! It is beautiful.